Life is very complicated these days. 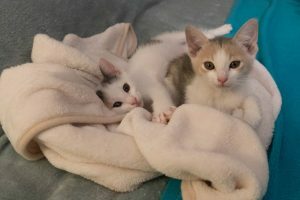 This morning, after consulting with the vet, I discovered that our giardia-ridden kittens will have to undergo a second cycle of treatment, which will begin next week. This means that they will have to spend another month holed up in their luxurious quarantine, poor dears! I am spending almost all of my free time with them…playing with them, feeding them, holding them, cleaning up, sterilizing, and being SUPER CAREFUL whenever I handle anything at all in the quarantine room. Well, okay, I admit, I HAVE had a few frustrating moments in which I’ve asked myself, and/or Stefano, HOW and WHY did we get into this mess??? Agh! And besides, these two kitties are so incredibly adorable and funny and affectionate…They act like normal, playful, curious, crazy kittens that zoom all over the place and then crash and sleep until they have enough strength to go back into the crazy kitten mode…I mean, you can’t tell that there’s anything wrong with them…except for the huge quantity of smelly pooparoni (though it’s MUCH better than it was a couple of weeks ago, let me tell ya)! Yuck! Okay, enough…It will only be another month, then they’ll be cured, and we’ll be able to let them out into the rest of the house…and meet their older siblings (yikes…a bit nervous about that). If we’re lucky, they’ll be well enough by Xmas. That would be a lovely present indeed! But that’s not the reason I’m writing this post, even though, hehe!! !, it might seem that way. Nope, this evening I wanted to write (then I got derailed, sorry!) about a new myeloma study that I bumped into just this morning…a very interesting, and mostly Italian!, study on myeloma and dendritic cells (DCs, for short), which is fully available online and has been accepted for publication in “Leukemia.” Here’s the link: goo.gl/wFMjS1 I’ve written a few posts on dendritic cells and myeloma, btw, so you can use my “Search Box” to have a look through my blog, if you want. The abstract begins with a good explanation of DCs: “Dendritic cells (DCs) play a key role in regulating tumor immunity, tumor cell growth and drug resistance.” The authors believe that MM cells may recruit and reprogram DCs in order to survive. They found a member of the microRNA family (a family of teeny tiny RNA molecules that regulate gene expression), called miR-29b, which is is not downregulated in normal DCs but, drum roll!, is downregulated in most types of cancer, including myeloma. Translation: more miR-29b, less myeloma cell proliferation. Now, it’s getting late over here in Italy, and I don’t have much time left. Stefano is on his way home (oh, oops, he just walked in the door…I have to go help him with dinner…He’s the chef tonight…). So I have to leave you with this study and all its complexities. Oh, and guess what? Curcumin upregulates the expression of miR-29b. Tadaaaaaa! I will have to keep my eye on these authors who are also looking into the role of this little molecule in the progression from MGUS to MM. Good stuff, good stuff!!! Take care, everyone!!! Ciao! Well, phooey! Last week we finally found out that our two new kittens have giardiasis, which is an intestinal infection caused by a parasite–giardia (see photo below…it looks like a harmless balloon with a scary face, but it’s actually a microscope image of this nasty little intestinal parasite)–which can be transmitted to humans, too, especially, eek, those with an immunodeficiency. How we found out about the giardiasis is a long messy (and smelly!!!) story that I’ll spare you. 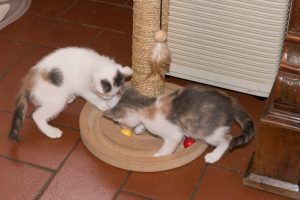 Luckily, the kittens have responded well to the anti-giardia drug and are in excellent shape now, gaining weight and so on. They are even more adorable and vivacious and funny, now that they are (obviously) feeling better. Many thanks to the lovely vet who, after others failed (no comment! 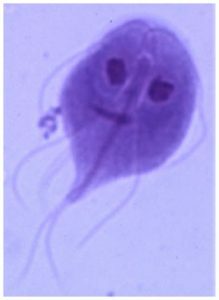 ), finally figured out what was wrong…and carried out the correct test, the giardia test…GRAZIE!!! So all is well and relatively calm in our feline household. I say “calm,” because Pandora and Pixie have not yet been released from their quarantine area (i.e., the guest bedroom, which, stuffed with all the presents that friends and neighbors have brought over, now looks even more like a kittens’ Disneyworld…Indeed, I’ll have to donate some toys to the cat shelter at some point…). Unfortunately, we will probably have to keep the two kitties under lock and key for another couple of weeks or so, until we’re sure that the giardia beasties are all gone for good…Bummer, eh! But, better be safe than sorry! 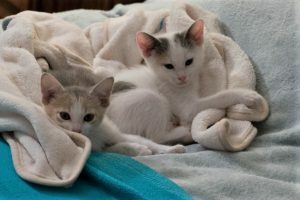 As you can imagine, taking care of the kittens in this period…doing laundry, disinfecting their room, disinfecting ourselves, making sure they are happy and playing a lot, doing more laundry (! ), and so on and so forth, has REALLY cut into my free time, so I haven’t finished my almost-ancient-by-now post about the EBV-MM link. That annoys me because it’s a very interesting post, to boot, so I will try to finish it in the next couple of days. For the past seven days I’ve been dividing my free time between our two new kittens and our resident adult cats. 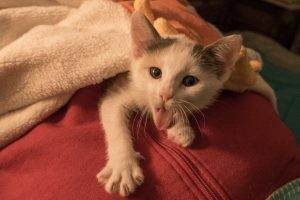 The two “groups” haven’t officially met yet, because the kittens have loose stools (not caused by parasites, luckily…so it’s probably just because of the dietary change…still, quite gross…and smelly, yuckaroni!!). We have to get rid of the kittens’ intestinal problems before letting them,er, loose in the house. I mean, it’s one thing to have TWO cats with intestinal issues, quite another to have SEVEN cats with issues. Ouch! So they are in quarantine in the guest bedroom. Of course, my adult cats KNOW that something fishy is going on behind that closed door. 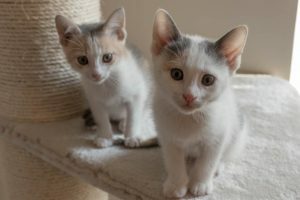 They can certainly smell and hear the kittens, especially when the tiny critters run around the room, chasing each other and making quite a bit of noise. But they haven’t actually SEEN them yet. I’ve transformed the guest bedroom into a kitten wonderland. It’s packed with our cats’ old toys and stuffed animals, and with NEW toys, too! 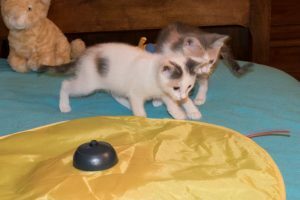 Most of our friends and neighbors who have come to see the new kittens have been bringing them NEW toys…so we have some new kitty tunnels and kitty wands. I’ll have to donate some to the cat shelter at some point! Plus, Stefano and I aren’t sleeping together, which is hard for both of us. He sleeps with the kittens, I sleep with the adult cats. It has to be that way until we let the kittens out of that room. But it won’t be for long. As soon as there is no more diarrhea, we will slowly and carefully introduce the adults to the babies. 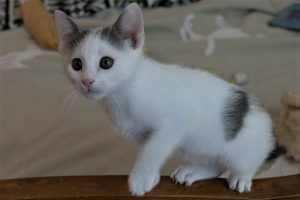 Now for their names: Pandora is the mostly-white kitten. 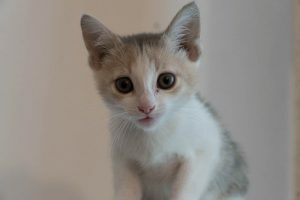 She is VERY energetic, playful, mischievous and, well, all over the place. 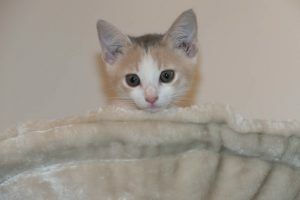 We have named the multi-colored kitten Pixie-Panacea (Pixie, for short; Panacea, the goddess of healing, was suggested to me by a few blog readers…thank you!). Pixie is much calmer and cuddlier. She’s also slightly smaller than Pandora, and not as tough. That’s the title of a very interesting BBC News article I read this morning, thanks to my friend Paul: goo.gl/pkXS1J It’s about two recent studies that examined patients with cancer (1. lung or kidney; 2. melanoma), discovering that those who had a lot of “friendly” gut bacteria responded better to immunotherapy. Okay, so the patients in the two studies didn’t have myeloma. But I would bet anything that those three types of cancer aren’t the only ones that are strongly impacted by our gut bacteria. I would bet anything that myeloma is on that list, too. Anything! Changes in the gut bacteria of SCT patients can cause severe infections and inflammatory bowel conditions…and also the scary and horrible GvHD (graft versus host disease). A 2015 U.S. study focuses on the role of Clostridium difficile (a really nasty sort of bacteria, as the word “difficile” implies!) during SCTs: goo.gl/AK5yQp. It concludes that C. difficile is one of the main causes of lower gastrointestinal distress in patients undergoing autologous SCTs. Yep, myeloma patients, too. 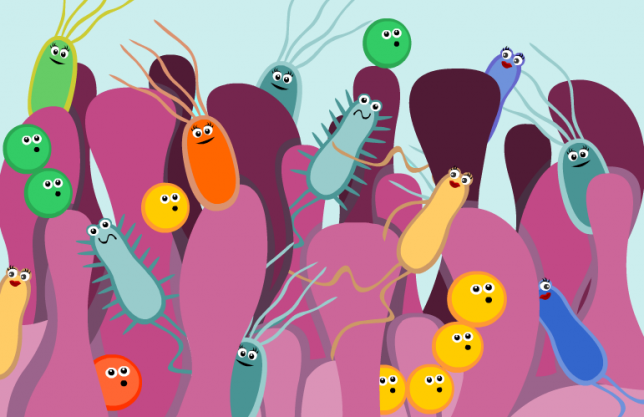 In sum, if you have too much bad bacteria, you can get into serious trouble…even if you’re healthy! I’ve said it before, and I’m saying it again today: we really need to pay attention to our microbiome.